Originally published in the November/December 2014 issue of Life Learning Magazine. I made a chocolate pudding with a whipped cream topping this past week. 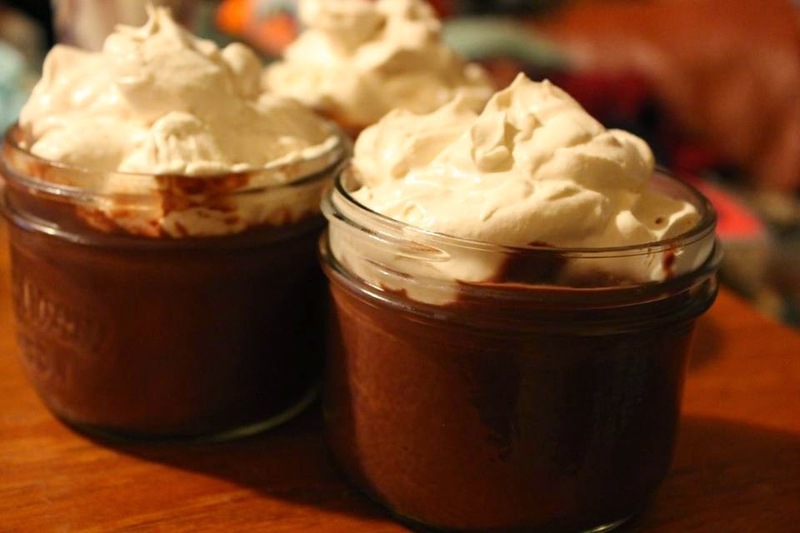 Using just coconut milk and semi-sweet chocolate, with some vanilla and rum for added flavour, the pudding tasted and felt more like a mousse than anything--rich and dark and creamy--and was in fact rich enough that none of my family could eat much at a time. In other words, it would be classified by some as “not good for you,” though I think it was an ideal treat, fun to make and eat. My sister and I, both adults now, have grown into adulthood with remarkably few issues around food. Neither of us have ever dieted, we’ve never counted calories or gone out of our way to avoid “bad” foods. I care whether the food I’m eating is healthy for me (which is why I tend to avoid soy, which messes with hormone levels), but I also feel strongly that health, when it comes to food and other areas of life, is about our emotional health as well as our physical health, which means that when I get a craving for noodles with fried tofu, the next time I’m at the grocery store I buy a big block of the stuff. In short, my approach to food is one of listening to my body and mind, and approaching both cooking and eating with an attitude of excitement, fun, and enjoyment. Guilt or limiting has nothing to do with it. The fact that my sister has a similar attitude kind of amazes me. Two women from the same house, and both of us have a healthy and joyous relationship with food? In the world we live in, which places a whole lot of pressure and guilt on women especially when it comes to food, I don’t think there is a magical set of steps that guarantees children will grow up with a good relationship to food (I certainly have my own set of issues when it comes to other aspects of life, regardless of my upbringing). Some of the reasons are probably as diverse as genetics, the communities we’ve been a part of, our personalities, and pure chance. However, I feel like some of the ways I was raised created an environment that was conducive to that positive relationship. Life learning wasn’t the sole contributor, for sure. But, I can’t help but think that my upbringing did have an impact… We weren’t radical unschoolers, we didn’t have unlimited access to sweets, and we were generally only allowed to have dessert after supper. I can’t really say whether that was a harm or a help, though I have felt that certain foods being “treats” meant that I only really discovered I wasn’t so fond of them later in life. Mostly, though, I don’t really care about what limits were or weren’t placed on food when I was young, since at this point in my life food is such a marvelously positive thing. I was never told I had to finish what’s on my plate. It was okay to stop eating when I was full. I didn’t have to eat if I wasn’t hungry. We had regular mealtimes because it was important to my father that he get to eat at certain times, but I didn’t have to eat then if I didn’t want to. My mother felt very strongly about never trying to trick us into eating “healthy” food. I never had to look at my meal suspiciously, wondering if something I hated was mixed in there. Any discussions we had about healthy eating were open and honest, and not a matter of manipulation. My parents never commented about our weight. It just wasn’t mentioned. There was no “you need to exercise more, you’re getting chubby” or comments about food being too fattening. While my mother might have frequently had insecurities about her own weight, that was never transferred to me or my sister. My parents very clearly and vocally valued us for things other than our looks. While my grandmother focused very much on prettiness and looks and activities that she deemed appropriately girly (in a well-intentioned though very misguided way), I always had the strong feeling that she was wrong to do so, a feeling that my mother very much validated. My mother always had great excitement for trying new things. That doesn’t mean my sister and I always felt the same. Children especially can be good at being very picky! But both of us did eventually develop a similar love for new flavours, cuisines, and dishes, as well as a love of making exciting new dishes ourselves. When I started to become really into food, my parents supported that passion. They didn’t discourage me from pursuing something so un-academic, or feel that I was wasting my time. Instead they just found me cookbooks, acted as very happy tasters, and encouraged me to pursue more food-related opportunities. They liked seeing me so happy about something, and I don’t think it much mattered to them what that something was. I’m a cook, and I’ve done some cooking professionally, and I’ve spent many more hours in my own kitchen. I can tell just how passionate I am about creating tasty food by how exciting a thought it is that no matter how many new dishes I make, there will always be more to try! Food holds a large and important place in my life. I love reading cookbooks and watching cooking shows, talking about food with friends and thinking up new dishes. Cooking is a main artistic outlet for me, and just generally causes a whole bunch of warm and fuzzy feelings. I’m drawn to the philosophy of “intuitive eating,” as it just seems really right to me that most people, if they’re never taught to distrust their own bodies, can figure out quite well what and how much is best for them to eat. We’re all different, and will all require slightly different fuels in different proportions, guided by personal tastes and preferences and availability. Instead of fighting against an individual’s naturally developing relationship with food and eating, telling them that certain foods are bad or “unclean,” and introducing a whole bunch of guilt and body shaming into the picture, it seems we would be much better served by always treating food with the respect it deserves. Food is about our physical and emotional health, it’s about our cultures and community, it’s personal and it’s social and it holds and expresses so much history and creativity and innovation. No matter how you look at it, food is important. And if we can embrace it with a sense of joy and discovery from a young age, hopefully it can remain something deeply positive throughout our lives. My upbringing wasn’t perfect. And no matter how good my upbringing was (because it really was pretty good), there are still a lot of negative messages and pressures to be found in our current culture. However, I do think that my parents got some things really right when it came to food, and I’m so grateful for the place it now holds in my life. I have a beautiful relationship with food, and I think that life learning helped me to develop it. I'm seeing a tag going around, proclaiming today to be National Start Homeschooling Day. 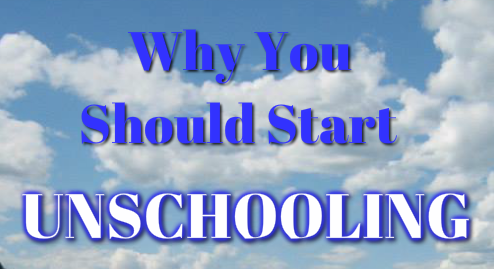 In honour of that, I figured I'd share my top reasons to start unschooling. I understand that, for any number of reasons, unschooling just might not to be doable in your life. If that's the case, I hope you can still glean inspiration for doing your best to devalue standardized assessments and instead place value on passion lead, self directed learning, no matter where it takes place. If, however, you are considering leaving school or taking your kids out of school, I hope these reasons will prove so inspiring that you actually do it! Forget teachers and standardized curriculum dictating what and how and when you should learn. Instead, learn about whatever really interests you, what you feel is truly important and relevant. Your learning then becomes truly personalized, unique to you and based on what you want and need. You get to spend as much time as you want doing whatever it is that you wished you could be doing instead of sitting in a classroom, bored by the current lecture. When you control your own learning, timelines of when certain things "should" be learned become irrelevant. Your child isn't a "late" reader, and you're not "behind" in math when you're no longer comparing yourself or your kids to others, based on what the school system thinks you should be learning. Instead, you can learn and grow at your own pace, and in your own way. We all learn differently, and unschooling allows us to truly embrace that. In school, there are teachers there to impart knowledge, and students attending in order to have knowledge imparted to them. Outside of school, you start to recognize that everyone can fill both of those roles at different times, and that the relationship between those who are teaching and those who are learning can be a cooperative, collaborative, and respectful one. Parent-child relationships, especially parent-teen relationships, can often be contentious. Fights often revolve around issues of homework, bed time (early school days seem to require one), and other school-related things. When you remove school from the equation, and when parents start striving to trust, respect, and truly listen to their children, relationships can change dramatically, and "teenage rebellion" can become a thing of the past. The forced socialization of schools, complete with bullies (both other children and sometimes even teachers), a lack of freedom of choice and movement, and an inability to choose more or less socializing based on each individual's needs, does not exactly promote the development of a healthy social life. As an unschooler, socializing can be based on the emotional needs of each child, and you can build a social life that truly feels good to you. Instead of learning in a single, age segregated building, unschoolers learn in the real world. You can learn at home, in nature, at the library, at museums and community centers and yes, in classes. The world opens up, and you start to see all the myriad opportunities that are all around you for learning that feels relevant and important in your life. For many students--including LGBTQ people, disabled students, and students with mental illnesses--schools can feel anything but safe or supportive. People learn best and are most creative in their learning when they're not stressed and afraid, so if family life is nurturing and loving, home can make a much better base for learning. Instead of being pushed to focus constantly, school-free learning leaves plenty of time for relaxing, processing, daydreaming, playing, and quiet introspection. As an unschooler you can reject ideas of "laziness" and choose to value the whole learning process, including boredom, not only the parts that look most active and productive. When you're not simply studying for a test or producing a project or paper that will never be seen outside of a single classroom, you can instead focus on work and creation that actually feels real. You can volunteer doing important work in your community, get a job or apprentice in a field that fascinates you, write blog posts and articles for an actual audience, create visual art for a community exhibition, and otherwise share yourself with the world. You have the time to do things that feel genuinely meaningful, and that make a real impact on the lives of others. All of these are compelling reasons why many of us have chosen unschooling for ourselves or our families. I hope that they encourage you to choose a freer, more personalized, more exciting way of approaching learning in your own lives, as well.